This program will get you up to speed with the four pillar of fitness (strength, endurance, speed and stamina) while using your local ParkRun to measure gains and maintain a competitive, motivated mindset. Ultimately, this program will lay a foundation to begin your triathlon career. This program is based on workout time, rather than distance as the distances covered will be dependant on your base fitness level. It begins with a gentle 4 sessions per week, with progression to 6 sessions by the end of the program. It will see you pit your skills against your local ParkRun every fortnight, with the ultimate goal of smashing your ParkRun PB out of the park in week 6. Indoor trainer speed work with building high cadence intervals. 10 min warm up (easy spin). (Adjust resistance on your bike so that you don't bounce on your saddle. You want all your energy going into perfect round circles). 10 min cool down (easy spin). Endurance swim to begin building a base swim fitness. 10 min freestyle with flippers. Hill strength walk/run repeats. Find a moderate hill with a flat approach. 5 min walk to warm up. Walk up and down hill (2 min uphill on toes to activate calves, 2 min downhill with controlled descent). 5 min walk to cool down. 45 min endurance ride on flat terrain. Keep a consistent effort to hold a low HR (max of approximately 180 minus your age). Bring two bottles - one nutrition and one water. Alternate between each bottle every 10 to 15 minutes. Drink before you are thirsty. Intervals. Warm up so that your HR reaches no more than 180 minus your age. Repeat run/walk. Focus on landing on your midfoot to forefoot during run, avoid heel striking. Strength. 15 min warm up. 10 min main set staying in higher resistance gears as often as possible. 15 min cool down easy spin. Speed work. 10 min warm up choose your own (ignore distance). 10 min intervals as 25m sprint, 25m backstroke FULL recovery (as many as you can in 10 min). 10 min cool down choose your own (ignore distance). 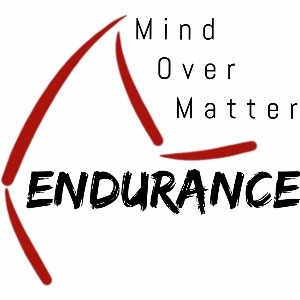 Mind over Matter Endurance coaching was born from a shared goal of husband and wife triathletes. We provide multisport coaching for the 'everyman athlete', where our motto is Your goal, our journey. We deliver a goal focused coaching service based on your unique training needs. We ensure support and accountability through positive encouragement and thoughtful two-way communication. This is provided through our holistic life experience approach, not simply a performance at all costs mentality.